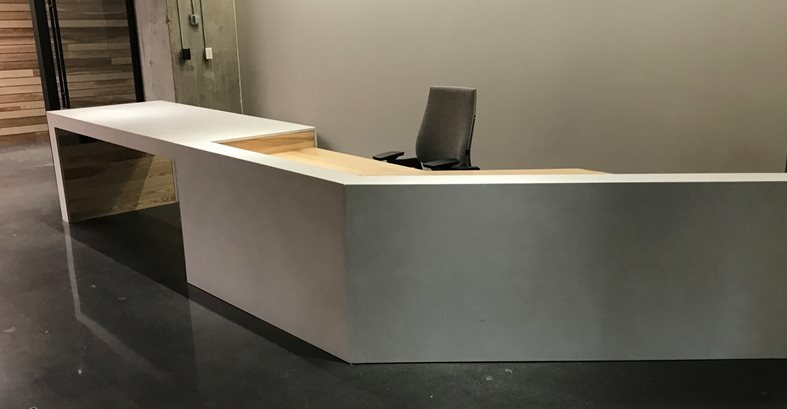 This angled reception desk made of white glass-fiber-reinforced concrete and wood makes a big impact while blending in seamlessly with Boston Consulting Group’s sleek, modern décor. Despite its size and long 12-foot unsupported span, the desk has only one seam, which adds to the streamlined effect. Templates were used to ensure that the concrete side panels of the desk would interface perfectly with the interior wood sections, which echo the wood graining in the room’s wall panels. 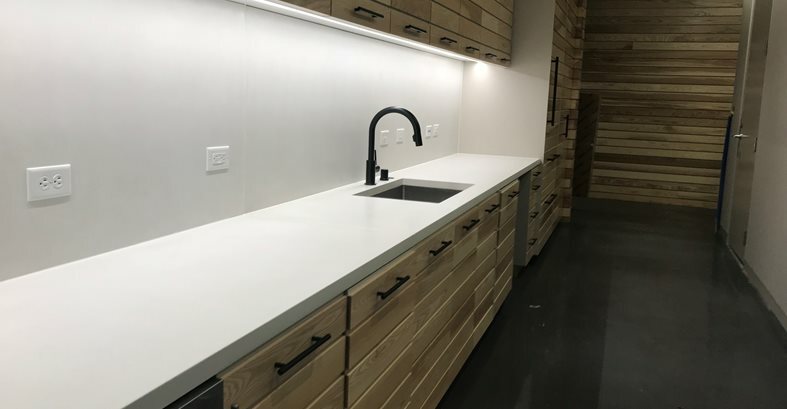 In addition to the reception desk, Living Stone Concrete Design also made white concrete countertops and wall panels for BCG’s kitchen and break room. Boston Consulting Group, located in the financial district of downtown Minneapolis, is a specialist in reimagining businesses and meeting the competitive challenges of the future. The minute clients enter the company’s office on the 23rd floor of RGB Plaza, they can see that spirit of innovation clearly reflected in the modern, streamlined decor, culminating in a massive reception desk made of white concrete. “BCG was looking for something that would be artistic and creative in design to capture interest while being made of a material that could provide a substantial look — heavy, thick and solid,” says Eric Mayne, president and lead designer of Living Stone Concrete Design. Mayne, who is also certified in traditional precast concrete and GFRC countertop construction, has devoted his career to finding ways to be artistic when working with various types of materials. On this project, he used his expertise to create a functional piece that would blend in seamlessly with the reception area’s sleek white and wood-paneled walls. 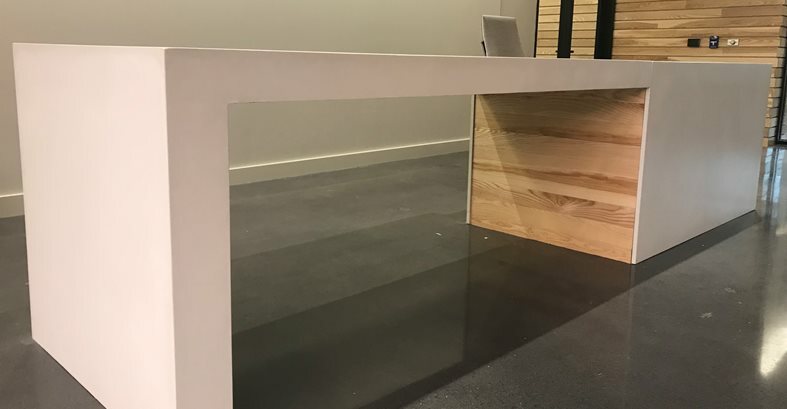 Despite its size and long 12-foot unsupported span, the desk has only one seam, which was made possible by the use of lightweight glass-fiber-reinforced concrete. “We used a GFRC mix with all white concrete and white silica sand as the aggregate. The 12-foot section with the waterfall edge is seamless all the way to the angled break. The length of the front panel on the return is 7 feet,” says Mayne. In addition to concrete countertops, Living Stone Concrete Design also makes custom furniture, fire features and other interior décor, crafting each piece by hand to bring the client’s vision to life. “We find inspiration in solving the unique challenges that occur with each design,” says Mayne. Living Stone Concrete Design, Lake Elmo, Minn.